Rep to Failure - A MuscleHack Journey: THT 4.0 V1 back and biceps day done! Yesterday was an interesting workout day. Unlike previous cycles where my friend Oscar and I would workout the odd time together, this cycle has been largely just me, by myself. Yesterday was a change in that we got to workout together for the first time in weeks. So, while I did get to spend some time spurring him on, I asked a favour of him. Thankfully, he agreed and shot a short video of my bent-over dumbell rows. So, armed with the fact that a quick review showed I had a bit shaky form, I quickly corrected it for my second set (and indeed, second half of the first set!). Currently, I'm uploading to my "catch-all" Youtube account, but I'll make another next week specifically related to my workout "self" and relocate the video there. Having said that, yesterday's gains were INSANE for a THT 4.0 Volume #1 Back and Biceps day. 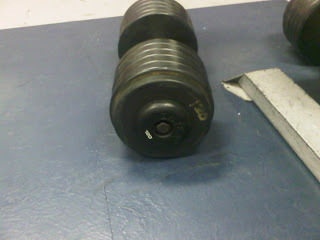 That was my first time "throwing" 120lb dumbells around for bent-over rows. I wanted at least 5, and I got 6. I needed at least 7 with the second set and got 8 reps. Bicep curls, always a favourite, progressed again. I can't always shoot video because I largely workout alone and don't want to bother fellow gym members, even acquaintances, with the task of "shooting" me. But, when I go with a friend, I'll see what I can do. Also, as a teaser, my friend Oscar has agreed to let me write an entry for MuscleHacker.com that is all about him - how he started out last spring at 340lbs and how he's feeling now at 250lbs. Once I have the content written and he approves it, I'll put it up for Mark's review. If I've ever "inspired" anyone to workout, I hope this story inspires 100X the people I have! All the best for a great weekend everyone! Train hard and lift safely! PS - I'll be off for the majority of the week next week on vacation, hopefully returning to the gym for a 3-day run starting next Friday. Or, I might just do two HIT days to recover before starting the next "week" of my cycle on the Sunday.